Robmeg Steels is a market leader in the Steel Manufacturing industry and much of their growth and success can be attributed to the fact that they invest in developing the knowledge and skills of their staff. 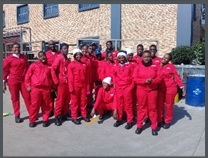 To aid this ethos of continuous development, Arc Skills set up a Welding Training Centre at Robmeg's premises with the aim of training 20 unemployed youth per year as part of their ongoing CSI and Community Development work. Upon successful completion of the Learnership many of the learners were employed by Robmeg. This is a continuing project and new Learnership recruits start on an annual basis.